Select and open the files you want open whenever you open Excel! 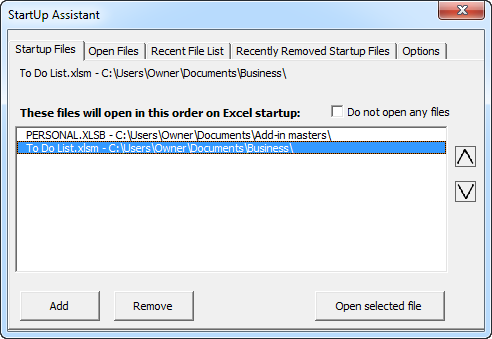 The Startup Assistant add-in for Microsoft Excel will automatically open any list of files you want open when you open Excel. It is compatible with Microsoft Excel 2007 to 2019 and Office 365. Excel does have a way to automatically open files. It done by placing files you want to open each time Excel opens in the Startup Folder. However, this folder is difficult to find and difficult to navigate to. And you have to constanly move files in and out. By default, few use this folder for its intended purpose. Basically a good idea, open files you need open all the time, but not properly implemented. The Add button allows you to select any file on your PC. The tabs at the top help you select previously openedfiles or files that you had on the statup list but had removed. There is even a check box option on the above screen to stop files from being opened without removing all from the list. The arrows on the right allow you to set the open order. The last file in the list is the one that you end up on when Excel opens. In this case we end up on our to do list which helps us focus on what tasks need doing.